Some more videos from the past month. It takes skill. It takes practice. 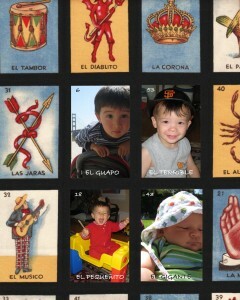 We threw together this fun poster of the boys, inspired by Mexican Bingo (for more info, read the Wikipedia article). Still deciding where to hang it. Moses and Oscar fight over who gets the truck. Cal gave away pom poms to the student section at the home opener this year. Mo gets his cheer on. Jojo and Momo compare jumping techniques. Labor Day weekend, the four boys hang out in the backyard around the rock table. It takes skill and practice. Mommy: I’m tired. Moses: No, I’m tired. You are currently browsing the Moses & Oscar blog archives for September, 2009.